Despite their name, farmhouses aren't just for farms anymore. This style of the house looks just as at home in the city as it does in the country, and farmhouse features like eat-in kitchens, and screened porches are perfectly suited to smaller living. 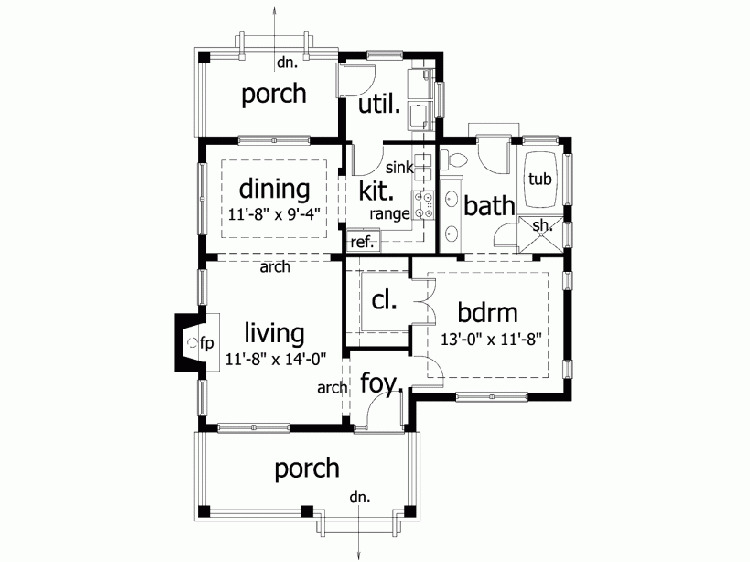 These tiny farmhouse floor plans come in a variety of shapes, but they share a cozy informality. They all make for the perfect place to raise a family or to spend the summer evenings of your golden years in a rocking chair on the porch! 1. 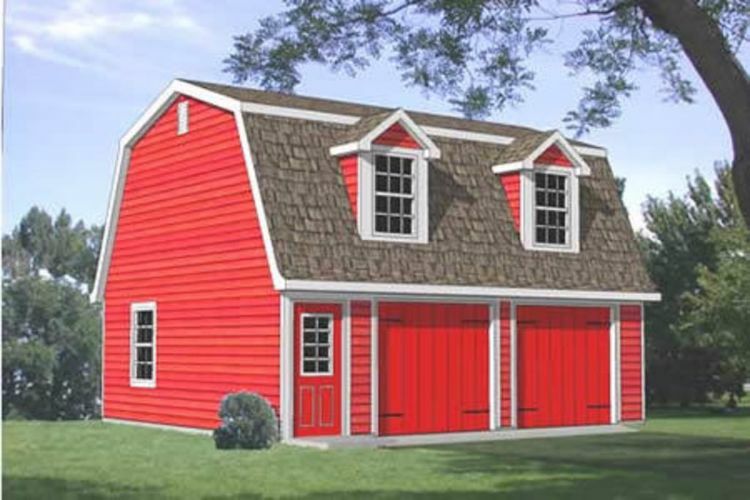 One story home with walk-in closet from ePlans. 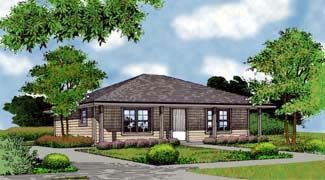 At 841 square feet (78 square meters), this design from ePlans includes a number of features often seen only in larger homes, including a gracious formal foyer and a walk-in closet in the bedroom. Warm up by the cozy fireplace in the living room, and pass through an archway to enter the dining room. The kitchen is just off to the right, and it leads to a spacious utility room that provides access to a small back porch. The bathroom is right off the bedroom, and it boasts both a tub and a shower. 2. 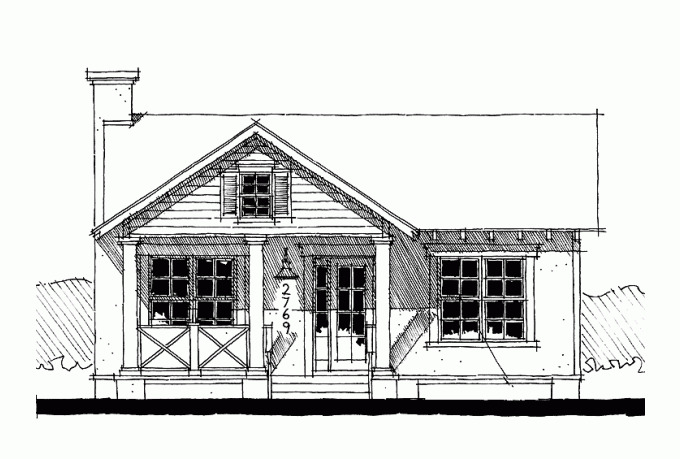 Farmhouse with sloping roof from Family Home Plans. 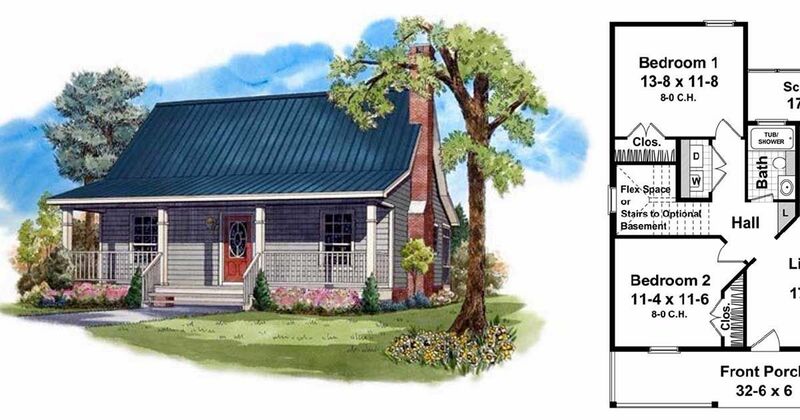 Coming in at 950 square feet (88 square meters), this design from Family Home Plans has both a front porch and a back porch. The front door opens right into the living room, and immediately behind it is the kitchen. A short hallway just off the living rooms leads to two bedrooms, a bathroom, and a laundry room. 3. 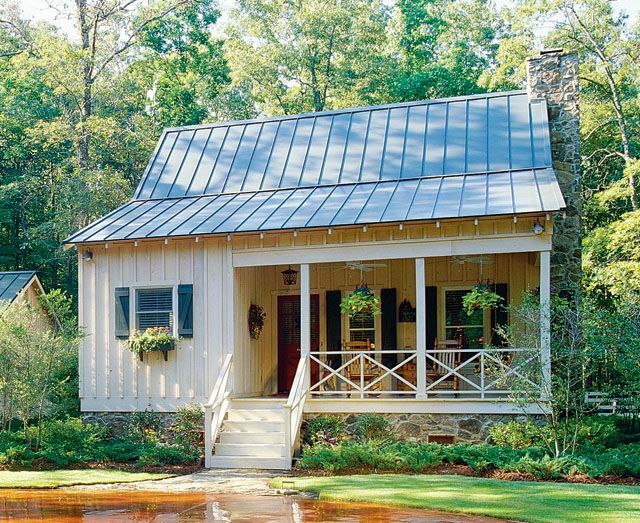 Adorable two bedroom cottage from Southern Living. 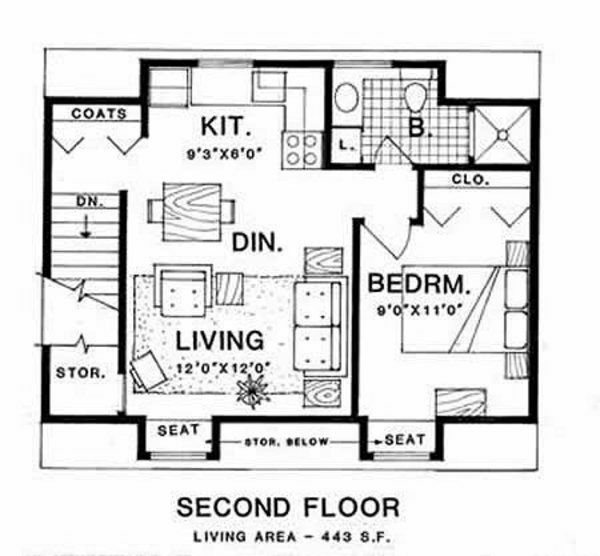 With two bedrooms and two bathrooms, this plan from Southern Living comes in at 973 square feet (90 square meters). A large living room with a fireplace takes up the space between the front and back porches, and the dining room and kitchen are just off to the left. 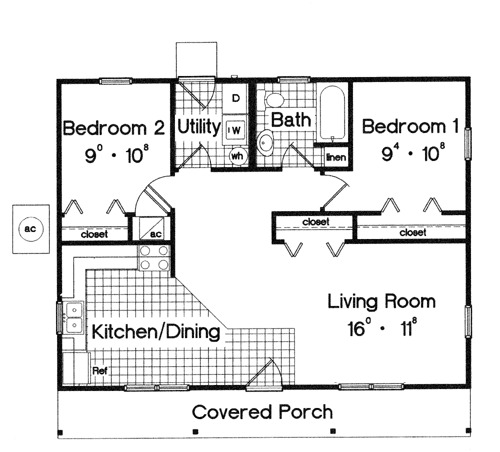 A bathroom and a bedroom are found in the back left corner of the home. A second bedroom is found upstairs, and it comes with its own attached bathroom. 4. 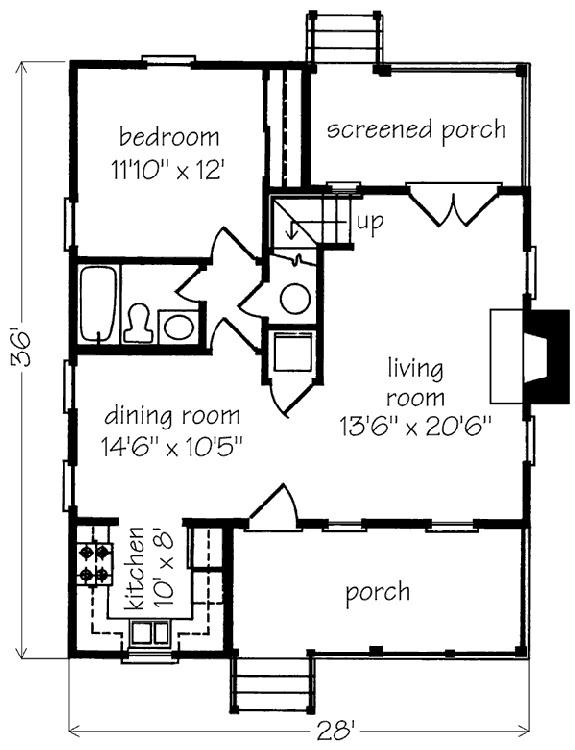 Tiny home over two car garage from Houseplans. At only 443 square feet (41 square meters), this design from Houseplans provides plenty of space to live comfortably. A coat closet is found right at the top of the stairs, and an open concept living room and eat-in kitchen take up the bulk of the home. 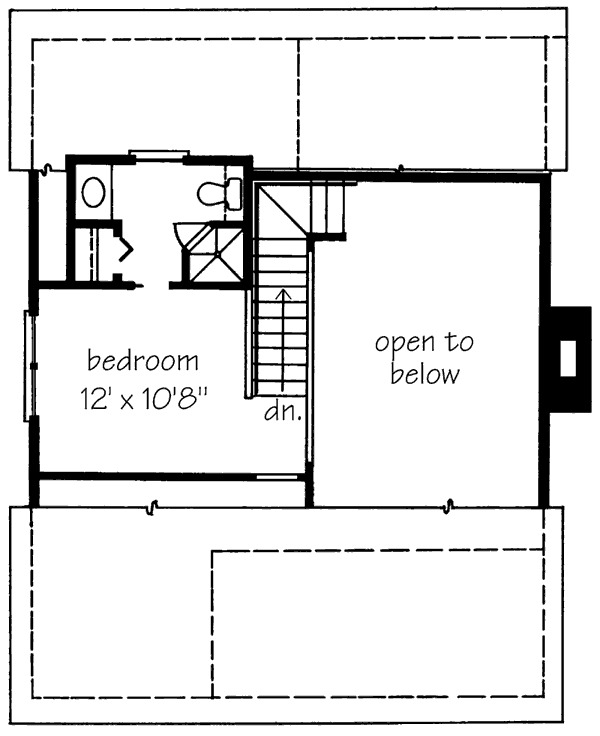 The bedroom is on the right-hand side of the home, and right behind it is a bathroom with space for a washer and dryer. Two built-in window seats give the home a bit of flair while offering additional storage. 5. 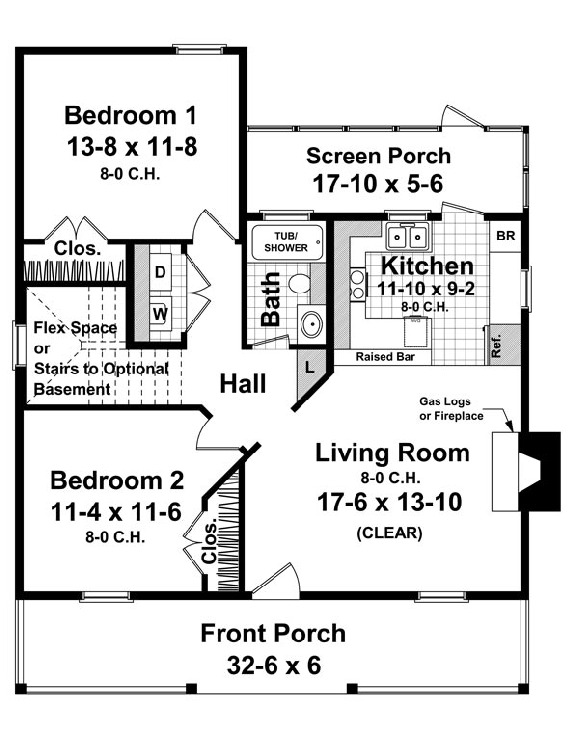 Two bedroom open concept home from Family Home Plans. 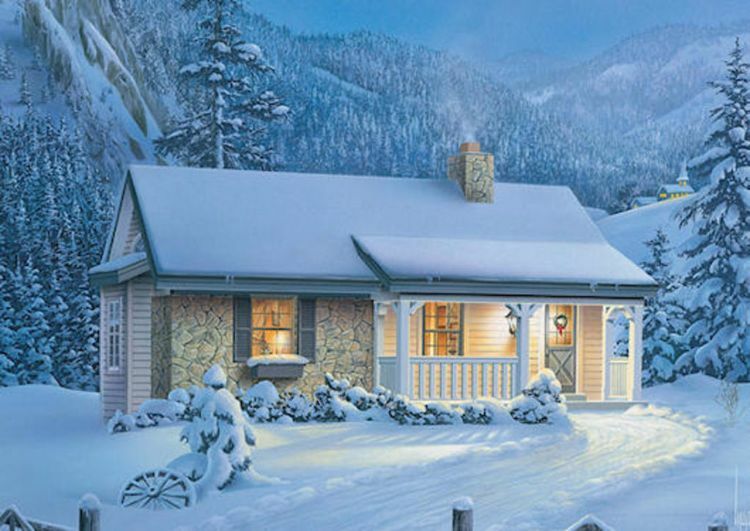 This design from Family Home Plans measures 873 square feet (81 square meters). 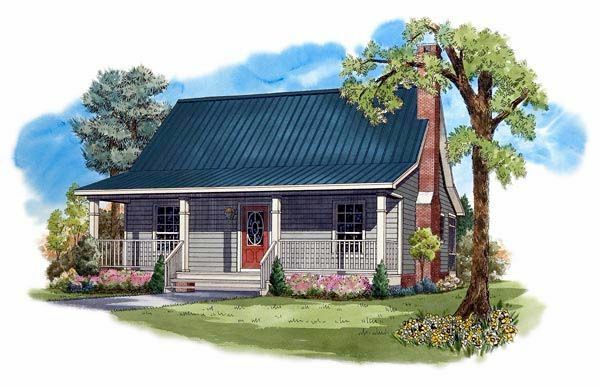 Pass through the covered porch, and enter the open concept kitchen, dining room, and living room. Bedrooms are found on both the back right and back left corners of the house, and a bathroom and a laundry room are sandwiched between them. The laundry room also holds the water heater, and it provides access to the back yard. 6. Ranch house with sunken tub from Houseplans. 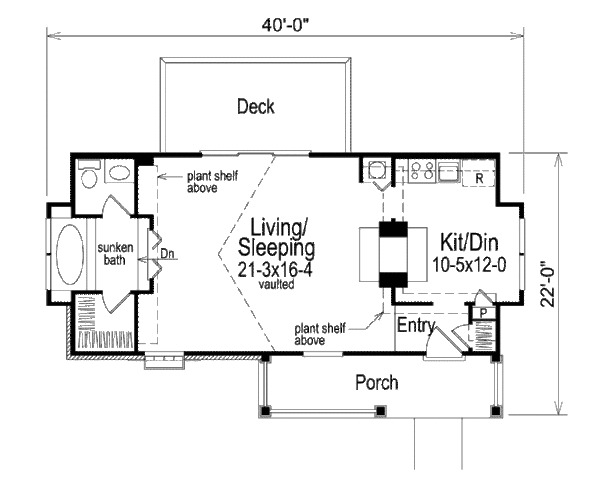 Perfect for a narrow lot, this floor plan from Houseplans measures 647 square feet (60 square meters). The front porch opens into a small mudroom, which leads right into the eat-in kitchen. Off to the left are an open concept living room and sleeping area with vaulted ceilings and two plant shelves. A luxurious bathroom with a sunken tub is on the far left of the house, and it provides access to a spacious walk-in closet.